Personnel – Mark Turner: tenor saxophone; Will Vinson: soprano saxophone; Aaron Parks: piano, rhodes; Nir Felder: guitar; Matt Penman: acoustic bass; Obed Calvaire: drums. Matt Penman was born in New Zealand but his hearty bass pizzicato and triumphant groove have been enriching the New York jazz panorama since 1995. Besides being an attentive bandleader, Penman contributes to prestigious bands such as SF Jazz Collective and James Farm, and collaborated with respected artists like Joshua Redman, Chris Cheek, Kurt Rosenwinkel, and Aaron Goldberg. 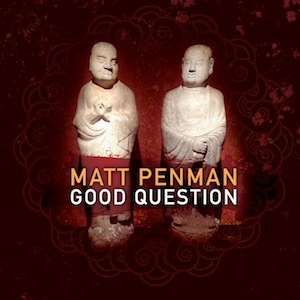 For each tune on Good Question, Penman asked a musical question to his bandmates and their responses were transformative and conversational. For instance, “Copeland” describes an aural safe haven from the traumas of modern life with an effective combination of jazz elegance and lullaby-ish folk melody. Working side-by-side with the warm brushwork of drummer Obed Calvaire, Penman sticks to a bass pedal, creating a polished anchor for Mark Turner’s gritty improvisation. Surpassing the limits of pure technique and exhibiting a haunting tonal glow, the saxophonist, who plays six of the nine tracks, deservedly claims the spotlight on “Cave Life”, ultimately sparking the circular vibes suggestive of electronic music and created by clockwork hi-hat marks (later turned into beat arrhythmias), glorious sax-bass unisons, and crisp Rhodes harmonizations. He also delivers on the opener, “Mr.Right”, which flourishes with a breathable groove, several rhythmic accentuations, more sax-bass unison phrases, and the visionary pianism of Aaron Parks, here showing an extraordinary ability to produce relaxation and tension on the same textural tapestry. Penman opens the improvisational section with the right foot, repeating the ride on the Oliver Nelson-esque “The Blues and the Alternative Truth”, a balladic recipe cooked up in the classical piano trio format and where his bass testimony slides effortlessly over a sparse piano accompaniment and balmy percussion. The dawning light of “Small Famous” brings a fresh, sweet serenity. Yet, after all, the tune is not devoid of an inner propulsive energy. The group has a remarkable rhythmic control at the same time that keeps searching for balance and common ground. Even in the face of a complex metric, everything sounds natural. If saxophonist Will Vinson transcends language on “Fifths and Bayou”, intimately fashioning lines with a soulful side that serves to attenuate the song’s introductory dark texture, then guitarist Nir Felder responds differently to a double call, presenting an attractive idiom with a mellow sound effect on the rhythmically shifting “Rider The Paper Tiger”, and a more bluesy inclination on “Big Tent, Little Tent”, a joyful groovy piece in seven. With the dominant thrust coming from the pliant rhythm section, the scenario becomes auspiciously enticing for the soloists, whose improvisational creativity is poured out with eager determination and a fertile imagination. Moreover, great compositions deserve wonderful musicians and Good Question is a good example of that.